The Golfers on Golf team gets out of the studio and hits the road for a LIVE remote broadcast from Arlington Lakes Golf Club. Golf Course Architect Mike Benkusky discusses his renovation plans for Arlington Lakes, and shares his perspective on golf course design. The guys chat with Golf Course Superintendent Al Bevers. The Island Hills Golf Club in Centreville Michigan, Chicago’s Southwest Michigan Golf Destination. Only two hours from the downtown loop. Just NE of South Bend. Stay and play on this Ray Hearn designed championship golf course with some great closing holes. 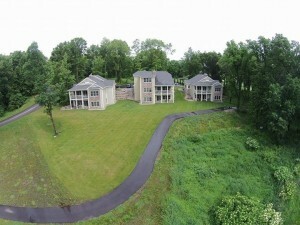 The new golf villa’s are are among the best in the Midwest, weekends almost sold out. Book your stay and play now ! Golfers on Golf Radio takes it to the golf course today, Arlington Lakes is the first road trip of the 2015 golf season. Come by, we are live from 9-10 AM on WSBC AM 1240 and WCFJ AM 1470. Arlington Lakes is open just one more week before it closes for renovation. Architect Mike Benkusky who will oversee the project joins us live along with other guests. 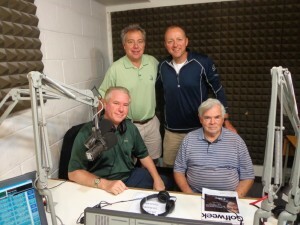 Golfers on Golf Radio celebrating it’s 20th season is (Standing Mike Munro and Ed Stevenson, seated L-R Rory Spears and Bill Berger). NCAA MEN’S GOLF CHAMPIONSHIP is halfway complete and Illinois that led after day 1, has fallen back into second place by shots behind USC. Stroke play wraps up on Monday, then the match play starts for the top eight teams advancing from the stroke play. The championship is being played at the Concession Golf Club, Sarasota Florida. THE SCHAUMBURG GOLF CLUB is offering fairways, food and fun in new programs. The club is now offering Family nights and 9 & Dine. Every Sunday from 5-6 PM families can enjoy a 9-hole walking round for $10 per-person. A golf professional will be the ambassador that welcomes you to the golf course, monitors pace of play, and provides instructional tips. Forward tees will be out on the fairway so the golf course is enjoyed by players of all skill levels. After golf enjoy special pricing on food and drinks, the chicken dinner at $9 a person or the burger dinner at $7 a person, dinners include one soft drink. Present golf receipt to get the discount, which is good only on day of play. Family groups are limited to four players and must have one player under 18 years old. Upcoming formats include Alternate Shot on June 5th, and Best Ball on June 26th. Contact the club at (847)-885-9000 to register. The 8th Annual Links Technology Outing that benefits the Schaumburg Park Foundation, will be played on August 12th with check-in starting at 9:30 Am with food and beverages offered at almost every hole. Call (847)-985-2115 or go online to schaumburgparkfoundation.org. 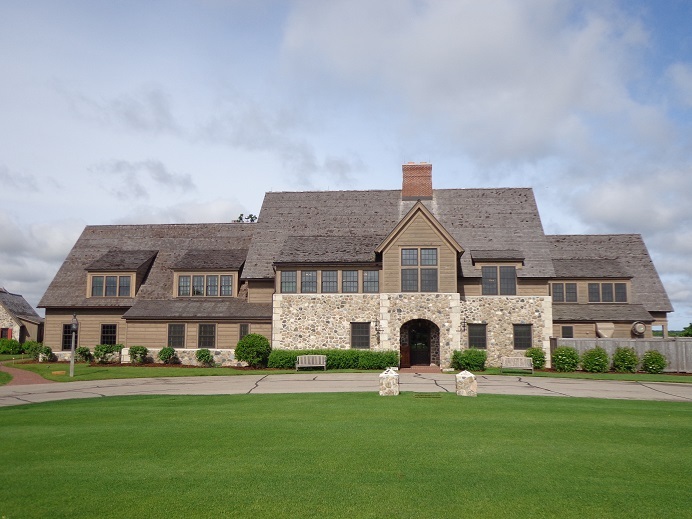 FOREST DUNES Golf Club in Roscommon Michigan is now open for the golf season. The Tom Weiskopf design rates among the best in the country, the Tom Doak new design is still under construction. 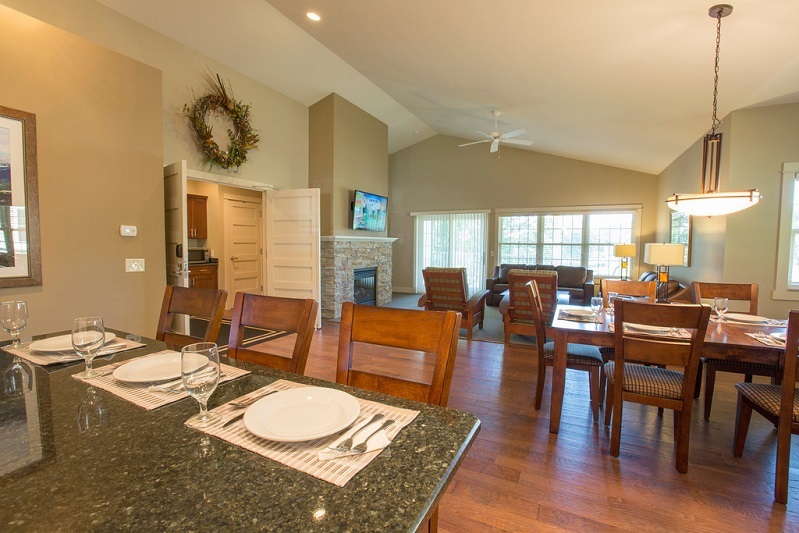 This year Forest Dunes will unveil it’s new villas, while the Lake AuSable lodge is open. The club has multiple stay and plays packages. Forest Dunes is set in 1,300 acres of property in the Huron National Forest. For more information visit Forestdunesgolf.com they can be found on Twitter @forestdunesgolf. CHARITY GOLF OUTING.. the Inaugural Bartend Chicago Invitational will be played on Saturday June 27th at Jackson Park Golf Course, the outing raises money for the Franciscan Outreach. For more information contact Kristina Wert at (773)-270-4875, or email Kristina@venyoeullc.com. 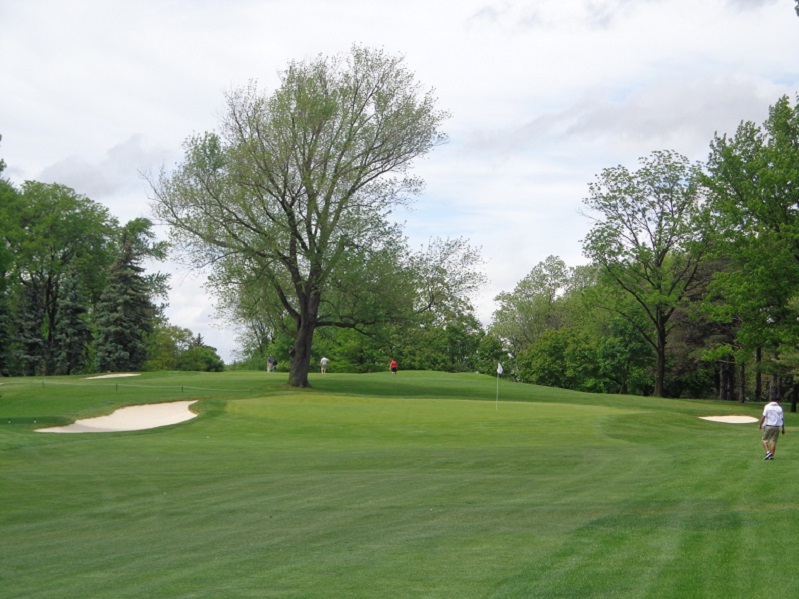 ARCHITECT CHRIS WILCZYNSKI will oversee a new tree management program for the famed Michigan Course Warwick Hills Golf & Country Club. The club was the home of the PGA Tour’s Buick Open from 1958-69 and again from 1978-2009. The program will correct turf issues on over-shaded greens and improve course play ability. The plan will reopen fairway corridors that have become clogged with extensive tree growth. Wilcynski will work arborist/agronomist Julie Stachecki. Both are Michigan State alums. The course has over 1,600 trees and some 400 will be removed or pruned back. More information visit cwgolfarch.com. THE BOOK CORNER..Greg Barton has authored, Golf is no Ordinary Game, no printed version yet but try Kindle and visit lga-architects.com for more information. Rob Fisher has published The Wichita Kid-Caddies-Story about a 12 year old kid who moves from Kansas to Cleveland Ohio and learns to caddie. See Amazon.com or Barnes and Noble. KEMPERSPORTS MANAGEMENT based in Northbrook, has signed agreements to manage several new clubs. The Ridgeclub in Cape Cod Mass., the Fountains Country Club in Lake Worth FL., Bay Point Golf Club in Panama City FL.,and the Mount Vintage Plantation in North Augusta, SC. THE EXGA Executive Women’s Golf Association one of the largest women’s amateur golf associations in the country, has announced that 17 more courses have joined their network of clubs in 2015. Among the Illinois courses are Prairie Landing Golf Club in West Chicago, and Arrowhead Golf Club in Wheaton. For more information ewga.com. or visit their Facebook and Twitter pages. 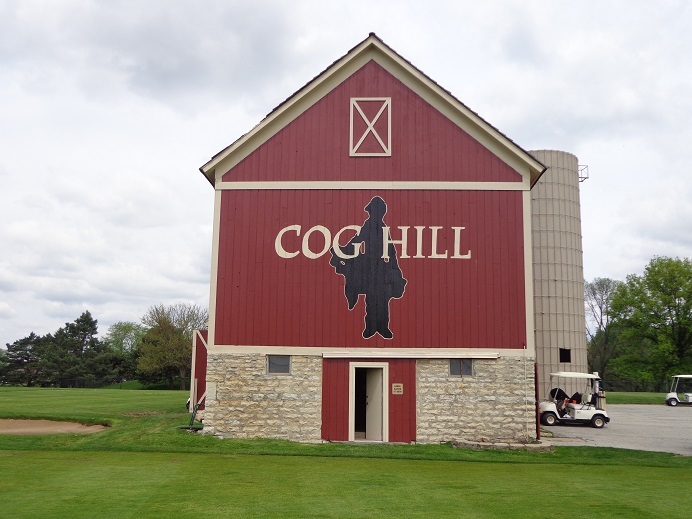 The Cog Hill 4-hour challenge, 7 Am shotgun, how many holes can you play in four hours, just $30. Dates include June 1 Courses 1 & 3, June 3rd on Course No.2, Friday June 19th, Course No.1 and Thursday August 13th Course No.2. Donuts & Doubles open to golfers 50 and Up. 7 Am shotgun, dates include June 5th Course No.1, June 24th Course No.3, July 20th Course No.3, Wednesday August 12th Course No.1, Wednesday September 9th on Course No.2, Only $30 visit Coghillgolf.com/tournaments for details or call (866)-264-4455 x318. CLEVELAND GOLF has announced the new TFI Smart Square Putter, it’s the most advanced putter the company has ever created. The putter is a tour inspired milled, copper-infused face cap over a copolymer insert for the ultimate in feel and in consistency. MAP $199.99 see Clevelandgolf.com for more information. It’s the LPGA’s turn to invade New Jersey with the ShopRite LPGA Classic this weekend. The Stockton Seaview Hotel and it’s Bay Course is the home of the championship. The tournament features 19 of the world’s top 20 ranked players in the Rolex standings. The Atlantic City area is well known for having top public access golf course, including the Atlantic City Country Club that has just undergone a renovation on the golf course and to the clubhouse. Visit PlayACGolf.com for more information. THE UNIVERSITY OF MICHIGAN has hired the Bloomfield Michigan based Resort and Golf Marketing to help promote the Universities Radrick Farms Golf Course marking it’s 50th anniversary in 2015. Architect Mike DeVries has created a master plan for the renovation of the UM course, the work is ongoing. NEED A FATHERS DAY GIFT, it’s coming on June 21st. New Balance now offers a variety of cleated and non-cleated golf shoes. The range of shoes runs from $89.95 up to $134.95. Models include Men’s NBG2003 Cleated Outsole, and Men’s NBG574B Non-Cleated Outsole. The Mt. Prospect Golf Club will reopen from renovation on or about August 1st, stay clicked in here for details on the grand opening date. 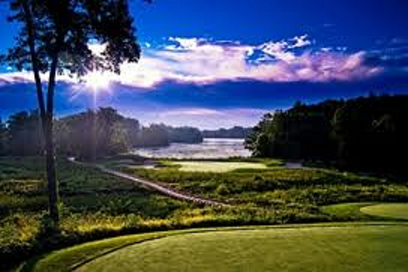 The Encompass Championship from July 10-12th will be held at North Shore Country Club in Glenview. The tournament is looking for volunteers see Encompasschampionship.com. Golfers on Golf Radio this morning live from 9-10 AM at Arlington Lakes GC on Wilke Road in Arlington Heights. THE ISLAND HILLS GOLF CLUB OF Centreville Michigan is Chicago’s Southwest Michigan Golf Destination, now Ray Hearns Championship design is flanked by some of the best golf villa’s you will find in the Midwest. Visit the new website Islandhillsgolf.com and book your stay and play today, weekend villas almost sold out. The Medinah Country Club, a home to three classic golf courses. 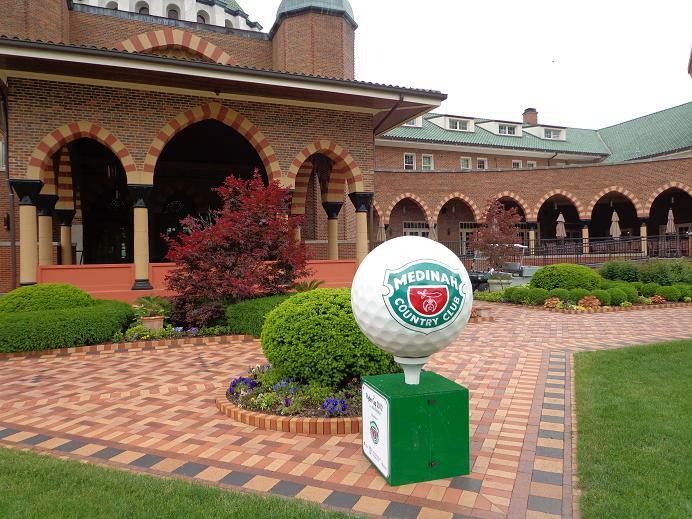 Medinah, one of the classic country clubs in all of the world. What they do makes a statement in the golf industry. In the fall the club will start yet another course improvement plan, this time on it’s Course No.2. Just a few years back, Medinah made improvements on it’s championship course 3, in advance of the largest Ryder Cup in the events history. Rees Jones got the call to oversee changes to the short par 4, 15th hole, some tree removal and upgrades of several greens. No sooner did the champagne stop flowing in the winning Ryder Cup European Team locker room, architect Tom Doak and his team started tearing up Medinah’s Course No.1. That course reopened last summer and the members are enjoying it. Now phase three gets underway with the restoration of architect Tom Bendelow’s course 2. There aren’t many original Bendelow’s left in circulation. Medinah No.2 is one of them. 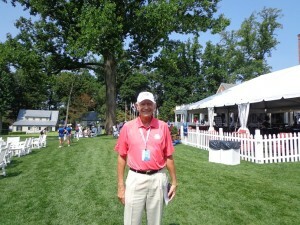 Medinah’s Director of Grounds, Curtis Tyrell. As a result classic courses like this one need to get restored, not renovated by some architect who wants to put his stamp on the project. That won’t be the case here, as Medinah’s Director of Grounds Curtis Tyrell will oversee the project. The consultant will again be Jones. Course No.2 has been known over the years as the ladies course, in recent years that hasn’t been the case. Men enjoy playing it, and the member families along with their kids do too. Which is why when the course reopens for the 2017 golf season, there will be some new improvements for the junior golfers who play out there. The 18th hole on Medinah Course No.2. This fall the work continues, and that’s because in a small way the work has already started. The club did some improvements and gave the members a little taste of what the new picture will look like, when they updated the the 8th hole. The green and bunker sand have already been changed. The white sand that now sits on courses 1 and 3, will soon rest in the bunkers of course 2. Some trees will come down to make the golf course a little more playable, the junior tee’s will go in. The new look on the 8th hole. The plan that worked so well on course 1, of getting the work done and letting the course settle into the following year, will be put in place again. Course 2 closes this fall, it will be back in play come 2017. Jones has some old photographs to work with, and his team will study them to help in the restoration. Tyrell talks about some of the things that those pictures show, how features have been lost over the years. Some of them will return now. Click here to listen to Curtis Tyrell’s Interview with BIG 3 Partners Len Ziehm and Rory Spears. Medinah No.2, will be another great piece to the Medinah Country Club when it reopens, it’s last major event was the Illinois Patriot Education Fund golf outing this past week. ARE YOU READY ? The progression is coming to Rich Harvest Farms, three tournaments in just 13 months. It starts next month with the Palmer Cup from June 12-14, USA vs Europe as the top college amateurs play a Ryder Cup Style event, walk the fairways with the players, parking and admission are free. This August the Western Amateur one of the top amateur events in the world, then in July of 2016, the LPGA International Crown team event, can the USA win at home at Rich Harvest Farms. Owner Jerry Rich has opened the front door this wonderful facility so you can see the top players in the world, why don’t you join him. Go visit Palmercup.org or Richharvestfarms.com for more information. 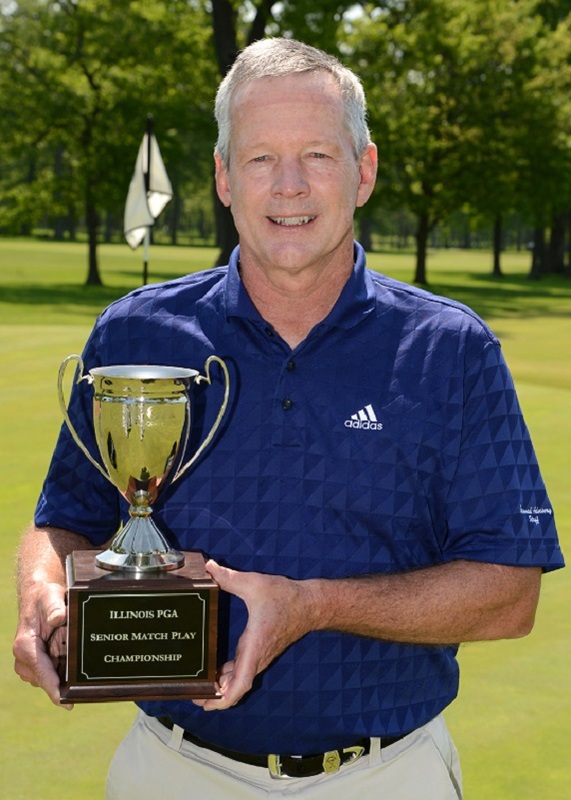 The first Illinois PGA Senior Major is in the books, and Doug Bauman the head golf professional at Biltmore Country Club is the 2015 Senior Match Play Champion. Bauman defeated Jim Sobb the director of golf at the Ivanhoe Club by a score of 1 UP in the championship match. The two golfers fought hard to the final hole before Bauman came out on top. The match play was back this year being contested at the Shore Acres Golf Club in North Chicago. The classic Seth Raynor designed golf course is a favorite among the local professionals and the golf course raters from several publications. Last year the championship was moved to the Merit Club in Libertyville, when Shore Acres was still recovering from issues to a few of it’s greens because of the harsh winter conditions. Billy Rosina and Mike Harrigan both with outstanding comeptitive records in the championship, were eliminated in the semi-finals. To start the week, 47 local senior professionals tee’d it up in the competition. For more information in Illinois PGA Championships or IPGA Senior Championships please visit IPGA.com. You can also a find a full recap of the brackets on the IPGA website for this championship. The Par 3 17th hole at Island Hills Golf Club in Centreville Michigan, Chicago’s Southwest Michigan Golf Destination. The new luxury villa’s on the right. Check out Islandhillsgolf.com for the stay and play packages. Weekend nights are nearly sold out for the summer. Just 2 hours from the Chicago loop, and just North East of South Bend. In the area of what we call Chicago and the surrounding burbs, they are plenty of golf courses, almost each one holds it’s share of golf outings. One of the premier outings in all of the Chicago area is hosted by Medinah Member Mark Slaby and it was played this past Tuesday on the Medinah No.2 course. Next year it moves off of No.2 to Medinah No.1. But what really hits a home run here, is not just the course the event is played on, but what the Illinois Patriot Education Fund golf outing does, and who it does it for. Now in it’s sixth year, the Illinois Patriot Education Fund sold out again in 2015 for a full field of over 140 golfers. The outing takes place the day after Memorial Day and raises money for educational scholarships supporting post 9/11 Illinois Military Families. The event has grown every year and along with the list of corporate sponsors that included, Fifth Third Bank, Blue Cross/Blue Shield of Illinois, Aon Corporation, Advanced Resources,Wintrust Banks, LawVision Group LLC, Avaya, Wheaton Academy, The Chicago Sun-Times Foundation, Joe Perillo Auto Group, Steve Cochran’s WGN Radio Morning Show, Clear Channel Outdoor, Cruises International, Tour Edge Golf, Pepsico, Maron Electric, the PGA Tour Superstore, Legacy Marketing, and Eaglewood Resort and Spa, each with their financial commitment has made an impact to help our military families. Mark Slaby (L) on the first tee of Medinah No.1 where the 2016 IPEF outing will tee off from. Chicago Blackhawks National Anthem singer Jim Cornelison opens the day with a rousing rendition of our national anthem over breakfast. Then the fund raising begins with outstanding donations that go up for auction. Many of veterans who get assistance do attend the outing, if you want to know where your money is going, no problem turn around and meet the scholarship recipient. IPEF bridges a gap between expenses not covered by the 9/11 GI Bill, and helps with educational and job assistance. Deadline to apply for this year is May 31st. Interested applicants can learn more or apply http://illinoispatrioteducationfund.org/apply-online/. Illinois Patriot Day Director Mark Slaby, spoke with BIG 3 partners Len Ziehm and Rory Spears, on Medinah Patriot Day. For more information on about next years event and when to sign up to make sure you can golf at Medinah see Illinoispatriot.org. Come be a part of one of the Chicago area’s top charity golf outings. The Palmer Cup starts the progression of tournaments coming to Rich Harvest Farms in Sugar Grove the week of June 10th through the 14th. It’s USA vs Europe in a Ryder Cup format style of matches between top rated college players. The event is named for the King Arnold Palmer, this August the Western Amateur comes to Rich Harvest Farms for the first time, then in July 2016 the LPGA UL International Crown will tee off in the first LPGA event in the Chicago area since the Solheim Cup at RHF in 2009. The Gog Blog by Rory Spears, Editor & Director of Content. Follow Rory Spears on Facebook,Linkedin & Twitter @GogBlogGuy. 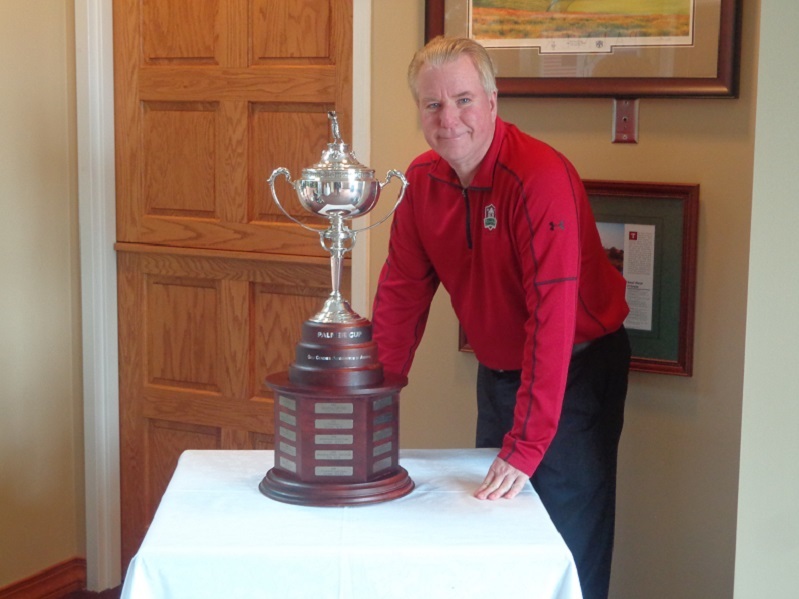 With the Palmer Cup Trophy at Rich Harvest Farms. The progression is coming to Rich Harvest Farms in Sugar Grove. What’s progression you ask, it’s a progression of tournaments that starts in June with a great international event, that becomes a major international professional golf championship in July of 2016. The amateur game returns with the NCAA Men’s and Women’s Championship Golf Championships in 2017, that however is another great story for another day. If you made it to Medinah and saw the Ryder Cup in 2012, then you understand the format for the Palmer Cup named after Arnold Palmer. The Palmer Cup Matches are played every year and rotate back and forth between Europe and America. 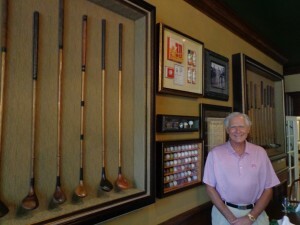 Rich Harvest Farms owner Jerry Rich with some of his historic golf collection at Rich Harvest Farms. Currently the United States holds a 9-8-1 advantage in the history of the Palmer Cup Matches. Long time European Tour player Jean Van de Velde is the European Team Captain. His assistant coach is Janice Moody who played on the 2009 Solheim Cup Team for Europe. For the United States, Georgia Tech head coach Bruce Heppler, he will be assisted by Chris Hill from the University of the Pacific. Each team is consists of 10 players, that earned their way on to the team in one of four ways. By points, a committee selection, a player was selected to the USA team that was not a NCAA Division 1 player, and on the European team one player was named via their performance in the R&A Foundation Scholars Tournament. Each head coach had one selection to put on the team. 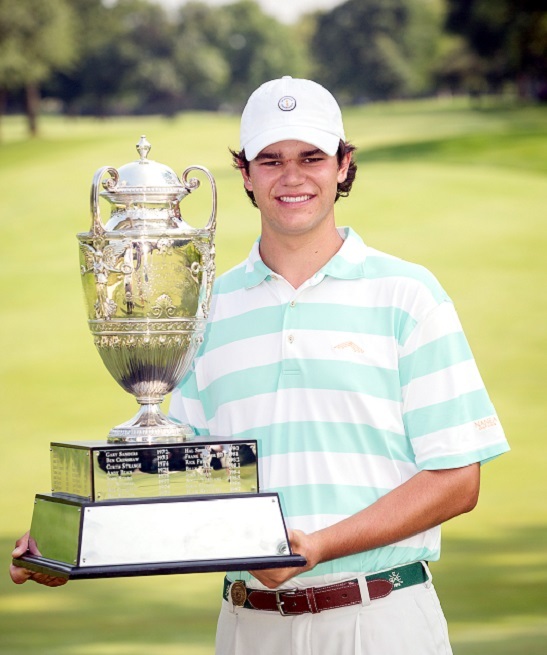 Beau Hossler the 2014 Western Amateur Champion at Beverly Country Club, will represent Team USA in the Palmer Cup. One member of Team Europe will be Fighting Illini Golfer Thomas Detry. Detry hails from Belgium and qualified through the point system earned by his play at Illinois. Beau Hossler who won the 2014 Western Amateur Championship, gets a sneak peek at Rich Harvest Farms where the Western Amateur will be played this August, as he will play for Team USA. Unlike the professional events, spectators will be able to get right up close to the players, and will be able to walk the fairways with them during the matches. More than 80 former players of the Palmer Cup Matches have gone on to play professional golf on either the European Tour, or on the PGA Tour. Some of them include former British Open Champion Ben Curtis, former U.S. Open Champion’s Graeme McDowell and Webb Simpson. Recent Players Championship winner Rickie Fowler is a past Palmer Cup player for Team USA. The Week starts on June 10th with a practice round and a Junior Clinic, Thursday June 11th is a college-am, opening ceremonies and the Palmer Gala at RHF that is sold out. June 12 matches begin with both Foursomes and Four-Balls matches. Saturday June 12th are singles matches, and Sunday June 13th are another set of Singles matches. Upon completion of play on Sunday are the closing ceremonies at Rich Harvest Farms. Admission and parking are free. There are plenty of items for purchase in the souvenier tent. For more information visit Palmercup.org or Richharvestfarms.com. For sales and marketing or to volunteer call (630)-466-7610. Island Hills Golf Club of Centreville Michigan, only two hours from the loop and just northeast of South Bend, Island Hills is Chicago’ Southwest Michigan Golf Destination. Come check out the new and popular villas, most weekends are sold out for the summer. 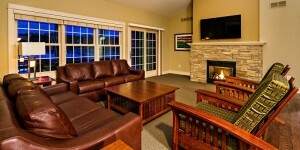 Visit Islandhillsgolf.com for the stay and play packages or call (269)-467-7261. The Medinah Patriot Day is tomorrow, visit Illinoispatriot.com for details on the outing , lunch, dinner and to donate or take place in the auctions. 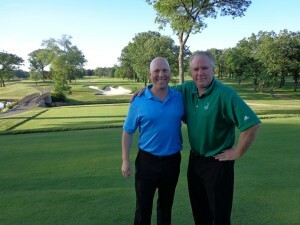 The Gog Blog by Rory Spears (R) with Mark Slaby (L) Director of Illinois Patriot Day tomorrow at Medinah Country Club. The IPEF helping Illinois veterans. Follow Rory on Facebook, Linkedin & Twitter @GogBlogGuy. The soon to be restored Medinah No.2 course, will host Illinois Patriot Day. Happy Memorial Day golfers and weather permitting a great day to play golf, then to be followed by 19th hole activities. Tomorrow is a great day to appreciate our veterans, who have served recently and over the years. One of Chicago’s top chairity golf outings will tee off tomorrow at Medinah Country Club, on the historic Tom Bendelow designed Course No.2. The course will get a historic restoration starting this fall under the watchful eye of Medinah’s Director of Grounds Curtis Tyrell, with architect Rees Jones acting as a consultant. There is still time to be part of Illinois Patriot Day tomorrow, in person or with a donation. Visit the website today and place that call, your support of our veterans from right here in Illinois is needed, Thank You. 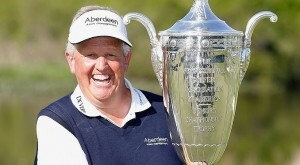 Monty does it again, his third senior major and second Sr. PGA Championship. Colin Montgomerie has done it again, he has won his second straight Sr. PGA Championship this time on the Pete Dye Course at the French Lick Resort. Montgomerie had to fight his way through the early front runners, and then fight off the late chargers, but neither group was able to pry the trophy away from Monty, whose goal was to return back to Harbor Shores still in possession of the Alfred Bourne Trophy. A tip of the cap or golf visor to 4th place finisher Brian Henninger who has come back from blowing out his elbow in the Sr. PGA at Harbor Shores last year. He had some 8 months off from golf before making a return this year. Henninger had to survive upon his return a pro-am round with me in Mississippi earlier this year. I look forward to seeing him at North Shore in the Encompass Championship come July. The Arlington Lakes Clubhouse in Arlington Heights. I’m really looking forward to our first live remote for Golfers on Golf Radio this coming Sunday at Arlington Lakes Golf Club. We will take a look at the upcoming renovation the will be headed up by architect Mike Benkusky, Arlington Lakes will close on Sunday June 7th for the summer so the work can begin. The Park District is hoping to reopen the golf course in June of 2016, the Arlington Amateur will be held on the final weekend the course will be open June 6-7. Oak Meadows had some preliminary work done in advance of it’s project starting on July 7th. Com Ed had do some removal of power lines that would be in the way during construction, so they had to be taken out. 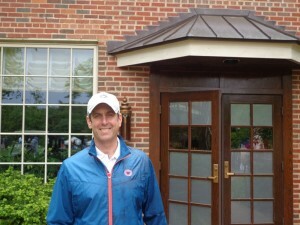 THE PGA TOUR was at Colonial Country Club in Texas, Chris Kirk did win and won the red jacket. But the signs showed by Steve Stricker continue to be positive, a final round of 3 under par left him at 5 under par for the championship. Stricker continues to come back from off season surgery and make progress as some of his favorite tournaments start to get closer on the schedule. Like the John Deere Classic and the PGA Championship at Whistling Straits in Wisconsin. THIS WEEK the long awaited for NCAA National Championship and No.1 (in some polls) Illinois head into action gunning for the national championship, with a team that might be the best team top to bottom that Coach Mike Small has ever had at this time of year. Action begins this week at the Concession Golf Club in Sarasota Florida, Go Illini. The weather might not be very dry this week, but golf season has arrived and the temps are headed north. GO PLAY. RS. Islandhillsgolf.com Check out the stay and play packages. The Villa’s with a view of the lake and the golf course. Island Hills Chicago’s Southwest Michigan Golf Destination. 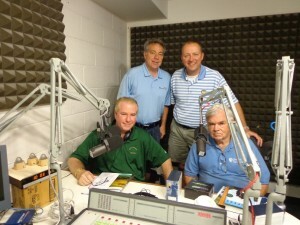 Golfers on Golf Radio Standing L-R Mike Munro and Bill Ed Stevenson, Seated L-R Rory Spears and Bill Berger. We are on the tee, headed for the sixth hole. 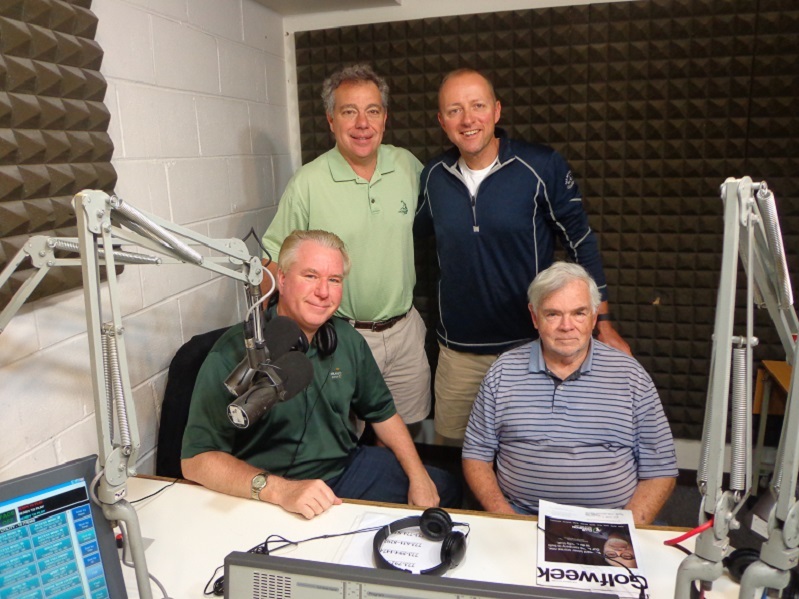 Golfers on Golf Radio today at 9 AM on WSBC AM 1240 and WCFJ AM 1470. Our guests this morning is Daily Herald Writer and BIG 3 Partner Len Ziehm, reporting live from the Senior PGA Championship at French Lick Resort. Where Colin Montgomery is leading heading into the final round and looking to defend his title won last year at Harbor Shores. Another surprise guest might be in the mix as well, so be tuned in. If you do miss us live you do get a mulligan if your on the course or the range. If your not there, it’s a 2 shot penalty. But we do post the show here on the website, later on Sunday or Monday for a re-podcast. 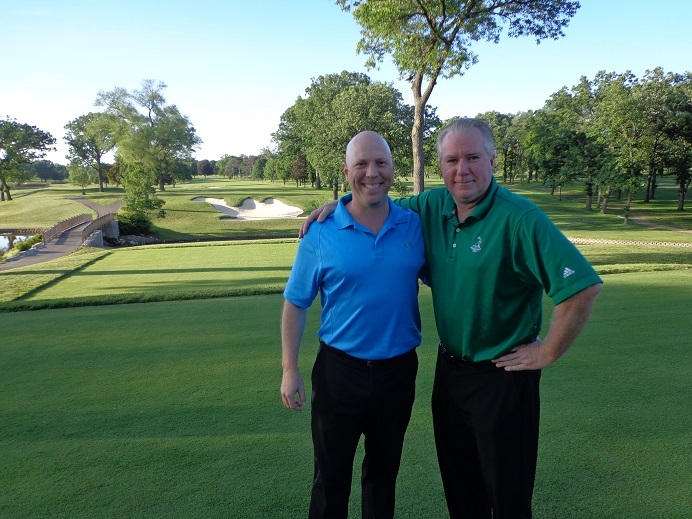 THE SCHAUMBURG GOLF CLUB has named Jonathon Parsons as it’s new General Manager. “I’m really excited for the opportunity,” said Parsons. “This has always been a dream for me, to achieve this position.” For more information on the Schaumburg Golf Club call (847)-885-9000 or visit schaumburggolf.com. CANTIGNY GOLF has announced some adult golf clinics. There are holiday weekend golf clinics, Memorial Day weekend, Fourth of July Weekend, and Labor Day weekend. The “Welcome to Golf” Clincis are designed to make the game more fun, saysConnie Demattia, Cantigy’s director of instruction. For more information on these clinics and other Cantigny Clinics visit Cantignygolf.com. Wednesday April 22nd, was the Eisenhower Tree Display Unveiling at the Eisenhower Library in Abilene Kansas. A piece of the famed Eisenhower tree from the Augusta National Golf Club was donated to the library after coming down from an ice storm in February of 2014. A similar section of tree will remain at Augusta National in it’s clubhouse. UNITED AIRLINES has opened a new route for the summer and into October for those of you headed to Bandon Dunes in Oregon. July through October fly to Denver and then right in North Bend near the resort. See UAL.com for details. NORTHWESTERN UNIVERSITY has announced they signed Luke Miller to a letter of Intent for the Mens Golf Team. Miller will on campus this fall and comes from Pennsylvania, he competed in the 2014 U.S. Amateur, finishing 1 shot short of the match play. DANNY RAINBOW has been named Director of Golf at Sentry World in Stevens Point Wisconsin, the course is now open for the season. See Sentryworld.com. Callaway is holding a demo day this afternoon from 1-5 PM at Cog Hill Golf Club in Lemont. Cog Hill has been selected as one of the 57 locations for the Golf Channel Academy, see Coghillgolf.com for details. University of Illinois golfer Grace Park has become a 1st Alternate for the Women’s U.S. Open to be held at Lancaster C.C. In Pennsylvania. Park shot 71-73 in a 36 hole qualifier in California. THE GOG BLOG RETURNS ON MONDAY, Go Play RS. The Progression begins on June 12th at Rich Harvest Farms, come see the Palmer Cup this amateur championship between Team USA and Team Europe. Walk the fairways with the players, no ropes, no charge for admission, free parking. Jerry Rich has opened the doors of Rich Harvest Farms and is ready for top level golf, are you. June 12-13-14 the Palmer Cup named for Arnold Palmer. The Gog Blog by Rory Spears, Editor & Director of Content. Follow Rory on Facebook, Linkedin & Twitter @GogBlogGuy. The Gog News Blog is full of great golf news this month. Then on Sunday don’t forget Golfers on Golf Radio at 9 AM on WSBC AM 1240 & WCFJ AM 1470. This Sundays guests include BIG 3 Partner Len Ziehm reporting live from the Sr.PGA Championship at the French Lick Resort in Southern Indiana, on the Pete Dye Course. The Encompass Championship will be held one month later this summer, and tournament week is July 7 through 12 at the North Shore Country Club. The tournament is looking for volunteers. Tom Lehman is the defending champion. The Western Amateur Championship that will be played in August 3-8 at Rich Harvest Farms in Sugar Grove is also looking for volunteers. Visit Wgaesf.com or visit Richharvestfarms.com. University of Texas golfer Beau Hossler is the defending champion. NOTHWESTERN GOLFER Dylan Wu was sitting in class when he received a text message from Coach David Inglis, that Wu was now in the NCAA regional at the Yale Golf Course. There was an opening when a golfer from St. John’s withdrew to play in a U.S. Open qualifier. Wu was the first alternate. Wu then went on to shoot a 3-under par three day total of of 207, and miss going to nationals by just 1 shot. Northbrook based P&W Golf Supply-Wittek has hired Kiko Stefanov as their new General Manager, Stefanov joins PW-Wittek after coming over from CDW. For more information see wittekgolf.com. The 2015 CDGA Mid-Amateur Championship was able to launch it’s new format, but the tournament was won by someone not so new to the field. Two-time Illinois State Mid-Amateur Champion John Ehrgott defeated Michael Natale 5 & 4 to win the championship. Ehrgott made 5 birdies and only 1 bogey in the match that lasted just 14 holes. Ehrgott played good all week, including during the stroke play where he was the medalist. Chris Schultz and Mike Henry were eliminated in the semi-finals. Cabot Links has opened for the 2015 golf season, are you ready for some great golf in Canada. The newly designed Cabot Cliffs Course by Ben Crenshaw and Bill Coore, will open this July. Stay clicked in for an opening date. Early reports say that the course is outstanding and that golfers will enjoy the golf and views.Visit the website for more details. 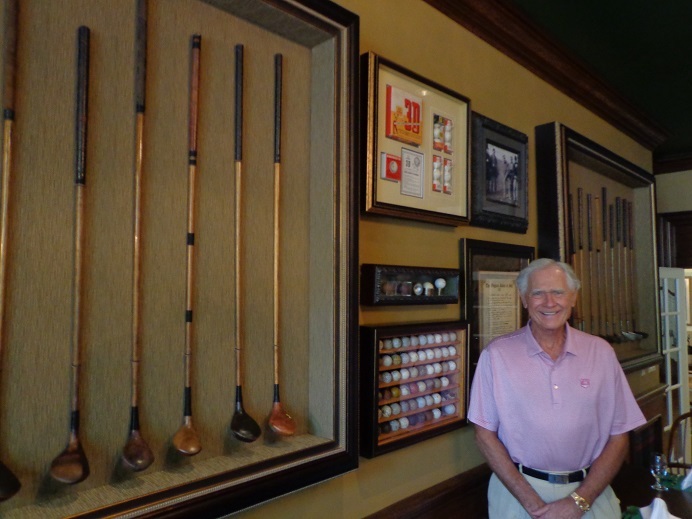 Mike Keiser has created another great golf destination. CANTIGNY GOLF in Wheaton has announced that Pat Hickey is now a PGA teaching professional, Hickey has completed the PGA Teaching Program. He will now conduct private and group lessons. Hickey joined Cantigny as a club fitting specialist in 2010. For more information visit Cantignygolf.com. DAVID LEADBETTER has a new book out, and it’s called, “The A Swing”, it’s the teaching pro’s first book in over Ten years. Leadbetter admits the book might be a bit controversial, but says golf instruction needs to be shaken up. Cost of the book now on sale is $27.99 via St. Martins Press. GOLF CHARITY OUTING coming up Friday May 29th at Cog Hill, for the Joliet ASSAC Charitable Foundation, it’s the 3rd Annual DSTee Time golf Tournament. Donation to help raise money for college scholarships is $150. If you would like to play visit tournevents.com/JASSACDSTEETIME to sign up. Erin Hills home of the 2017 U.S. Open is open for the season, and they are currently offering stay and play packages. Right now you can play one day at the full rate, spend the night and play a second round for only $145 dollars. This package runs through July 19th, and will run again in October from the 16th through the closing date on the 25th. Erin Hills is also offering special holiday packages for Memorial Day Weekend, Fourth of July Weekend, and Labor Day weekend. Visit Erinhills.com for details or call (866)-772-4769. PGA.com the 2016 Sr. PGA Championship returns to harbor Shores for a third time. Ryan Ogle has been named championship director for the 2016 Sr. PGA Championship that will return to Harbor Shores in Benton Harbor Michigan. The championship will be played on memorial Day weekend in 2016 from May 26-29. Ogle from Oklahoma City, Oklahoma has work in a variety of positions at the 2012 Ryder Cup, and the 2014 and 2015 Sr. PGA Championships. “I am thrilled and honored to be leading our day-to-day efforts with the Senior PGA Championship presented by Kitchen-Aid at Harbor Shores,” said Ogle a graduate of Oklahoma State University. ” I look forward to helping showcase this world class competition in a world-class community. Colin Montgomerie won the 2014 Sr. PGA Championship at Harbor Shores. The golf course is open for public play and was designed by Jack Nicklaus. SPEAKING OF THE GOLDEN BEAR, Jack Nicklaus is out with his new line of ice cream just in time for the summer months. It’s available at Winn-Dixie, Bi-Lo and Kroger stores, it comes in seven flavors including Triple Chocolate and Strawberry Lemonade. 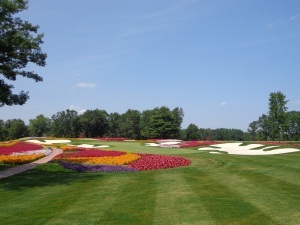 SentryWorld.com the Flower Hole the par 3 16th. Sentry World in Sevens Point Wisconsin has reopened on a full scale after a full renovation by Robert Trent Jones Jr. and Jay Bilasi. It has already received top rankings from multiple national golf publications. Sentry World has also announced that it’s online store has opened. Long time Sentry World head professional Brian Dumler has accepted a new position at Sentry World as the head of golf instruction and will become the teaching professional. Visit Sentryworld.com for more details. DEMO DAY this Wednesday at Foxford Hills Golf Club in Cary,with Titleist from 3-7 PM. Please call the pro shop for an appointment. Cobra-Puma will be at the course on June 7th from 9-1:30 PM. The pro shop can be reached at (847)-639-0400. The list of Golf Digest’s Top 100 Public Golf Courses are out, and Cog Hill Course #4 Dubsdread has moved up 11 spots to No.53 on the list. “Moving up 11 spots on this list is quite an achievement,” said Frank Jemsek, CEO and owner of Cog Hill Golf & Country Club. “Our renovation seven years ago has made Dubsdread more relevant to today’s golfer in regards to distance off the tee and club selection into the green. Our customers really like the changes, they find them challenging but fair.” Providing the best public golf in Chicago has been and will be our top priority and we appreciate Golf Digest recognizing Cog Hill on the national level. Dubsdread is No.11 on the Best in State list by Golf Digest, and the only public course in the top 15. THE BUFFALO GROVE golf courses will be outsourcing it’s maintenance operations and it’s a move expected to save the village over a million dollars in the next five years. The company being brought in is the Reliable Property Services Company of St. Paul Minnesota. There is a 3 year deal in place with options for two more years. 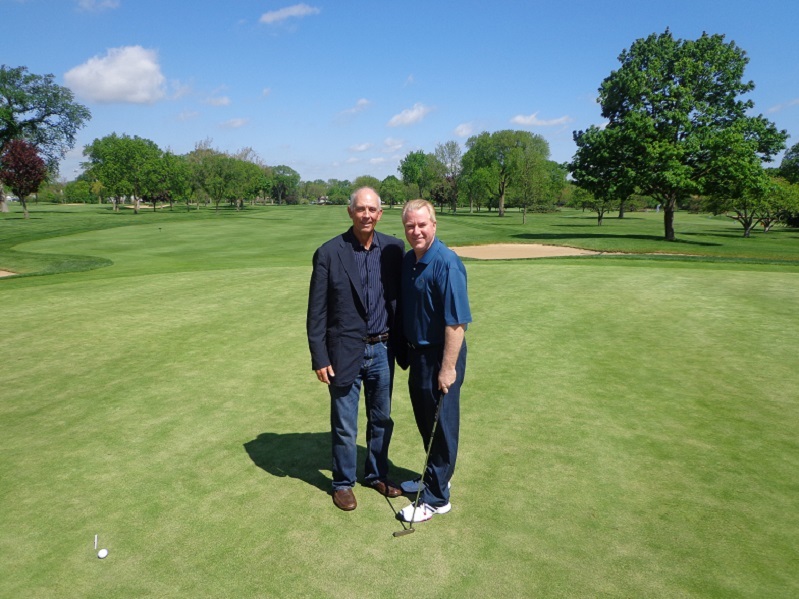 Services will be used at both the original Buffalo Grove Golf Course and the Arboretum course as well. 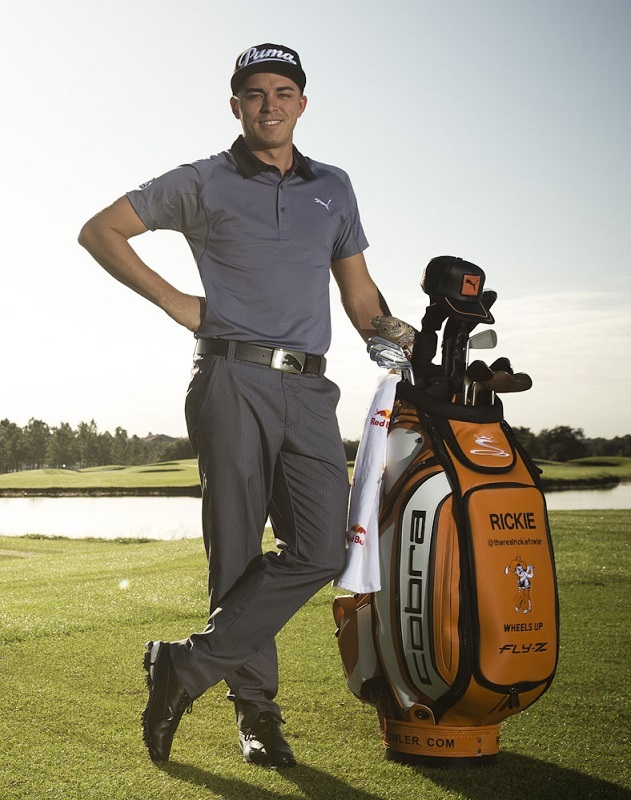 Rickie Fowler and Puma, with a new deal. Rickie Fowler the winner at the Player Championship has signed a new long term extension with Cobra-Puma Golf. Fowler coming off of his best season on the PGA Tour in 2014, that included top 5 finishes in all four of the major championships, has capped it off with a win at TPC Sawgrass earlier this month. “Rickie defines the new generation of golf-his approach to the game, on and off the golf course, is in line with the values of Cobra Puma Golf,” said Bob Philion, president and CEO of Cobra Puma Golf. “I am extremely proud to be part of an innovative, exciting and creative company,” said Fowler. “Cobra Puma Golf and I have shared incredible success over the last five years and I’m looking forward to the next chapter.” Fowler play Fly-Z woods and AMP Cell Irons. Islandhillsgolf.com Centreville Michigan, just north of South Bend Indiana. 2 hours from the Chicago loop. Wanna Golf Away, it’s not too late to head over to island hills Golf Club in Centreville Michigan, Chicago’s Southwest Michigan Golf Destination. This Ray Hearn 18 hole Championship golf design has some of the best closing holes you will on a public golf course. Why not relax in the Island Hills Villa’s with views of the course and the lake. 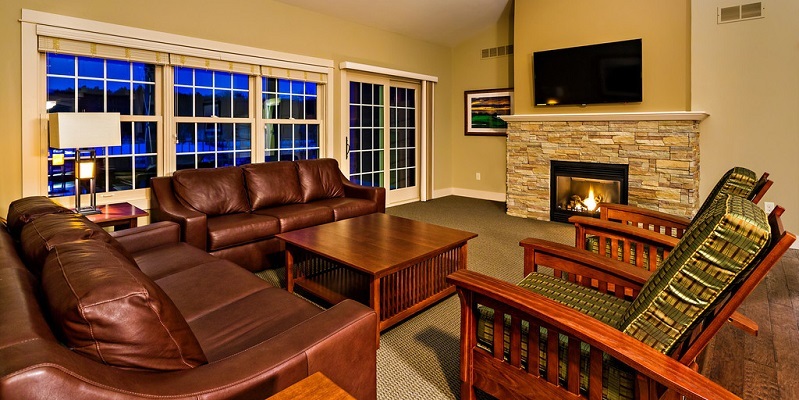 Check out Island Hills Stay and Play packages at Islandhillsgolf.com or call (269)-467-7261. Mt. Prospect Golf Club re-opens on August 1st, stay clicked in for details on opening day. It’s getting closer, opening day at the Mt. Prospect Golf Club in Mt. Prospect. This Dave Esler renovation will give the public golfer a feel for some of great designs done by historic famed architects like Seth Raynor and Charles B. Macdonald. Opening day is expected to be on August 1st, maybe sooner if the weather helps grow in the grass a little faster. See Mppd.org for more details. The Palmer Cup is coming to Rich Harvest Farms this June 12-13-14, walk the fairways with the players in this International Event. This August the Western Amateur comes to Rich Harvest Farms, Jerry Rich is ready for two great golf events at his Rich Harvest Farms, are you ? THE GOG BLOG: BY RORY SPEARS. Follow Rory on Facebook, Linkedin, and Twitter @GogBlogGuy. THE Encompass Championship tee’d off this past Monday with media day at the North Shore Country Club, defending champion Tom Lehman was on hand to speak with the media and sponsors of this years tournament. (Above) Lehman with the only person who was able to recreate and make the winning putt from last years championship on the final green at North Shore with the camera’s rolling. Island Hills Golf Club in Centreville Michigan is Chicago’s Southwest Michigan Golf Destination, See Islandhillsgolf.com for stay and plays on the Ray Hearn Championship designed golf course. The 2015 Encompass Championship tee’d off on Monday with media day and a visit from defending champion Tom Lehman, who expects to be right in the hunt in this years tournament. Lehman came in on Monday morning fresh off a 4th place finish in the previous weeks Champions Tour event. But his game continues to be solid and he should be in the mix again with the other big names that will play that week at North Shore Country Club. If there is one disappointment about this years championship is that nobody is sure about what the future holds. Encompass Insurance will retire as the primary sponsor and no new title sponsor has been named as yet. North Shore Country Club has major renovation plans on the table for the golf course, clubhouse and the pool. But there is no word yet exactly when they will start and or what order they will happen in. If the golf clubhouse or golf start renovations, the tournament will have to find a new home. The championship released a statement this afternoon that they are looking for volunteers for the championship, to volunteer visit the tournaments website listed below. Tom Lehman held a press conference and he had several entertaining stories along the way, plus answers to golf questions from the assembled media. Below is a replay of that session. Click here to hear Tom Lehman’s press conference at North Shore Country Club. Stay clicked in to the Gog Blog for more information on the Encompass Championship as we get closer to Championship Week. The dates are new for 2015, having moved back to July 10-12, tournament weeks starts on Tuesday and there are a series of pro-am events. Celebrities will play during the tournament again, a list of those will follow shortly. Visit Encompasschampionship.com for tickets, volunteering and other information.